When Prophet Ibrahim (AS) and his son Prophet Isma’il (AS) were building the Holy Kabah, he stood on a rock to aid him in the construction. It is known as Maqam-e-Ibrahim and it still holds his footprints to this day. To discuss Maqam-e-Ibrahim, we used Play Doh. We rolled it out, then I had my daughter step on it to leave her footprints. We discussed how Prophet Ibrahim (AS) left his footprints near the Holy Kabah, and we can still see those footprints. To take it one step further, you can try to leave footprints on a rock. We would not be able to leave our footprints in the rock. 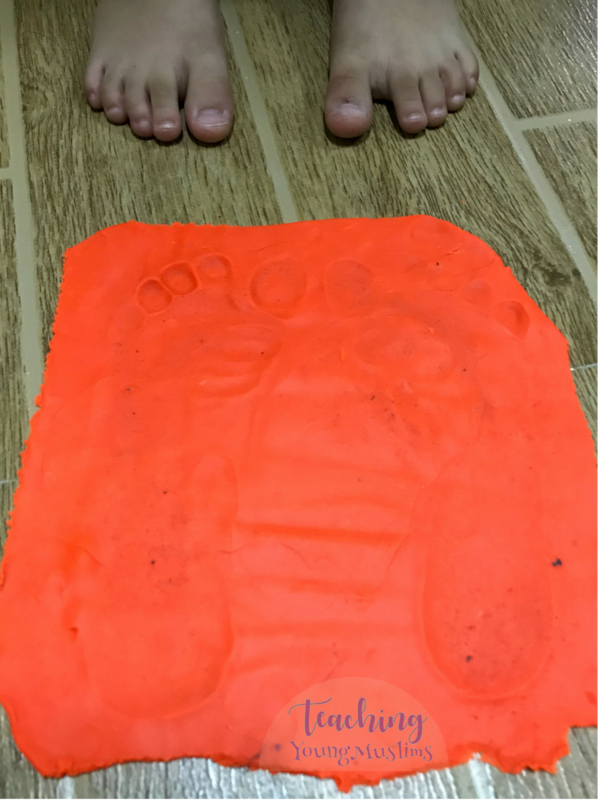 We can only leave our footprints on something soft like Play Doh. In this way, we can discuss the miraculous nature of the fact that Prophet Ibrahim (AS) left his footprints in the rock. If you loved this post and want to make sure you don’t miss out on any future posts, subscribe to receive all posts by email on the side! You can also like my page on Facebook and Instagram. All the links are on the side!